The race is part of the #TrailsRoc – Trail Runner Of The Year Series. DESCRIPTION: A Trail 1/2 “ish” Marathon that will lead you on some of Rochester’s best trails. 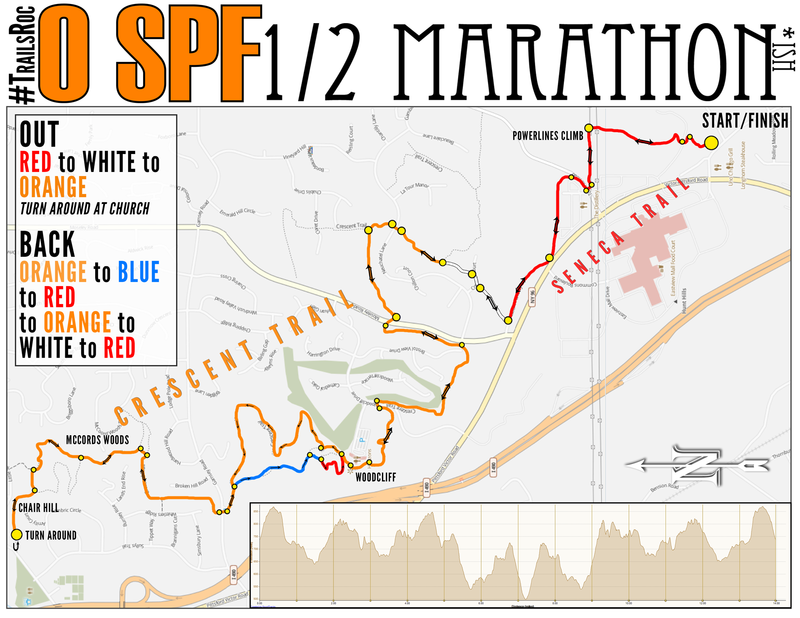 The course is an out and back that will encompass both the Seneca Trail and The Crescent Trail. You will encounter single track – creek crossings – hills and summits with great views. 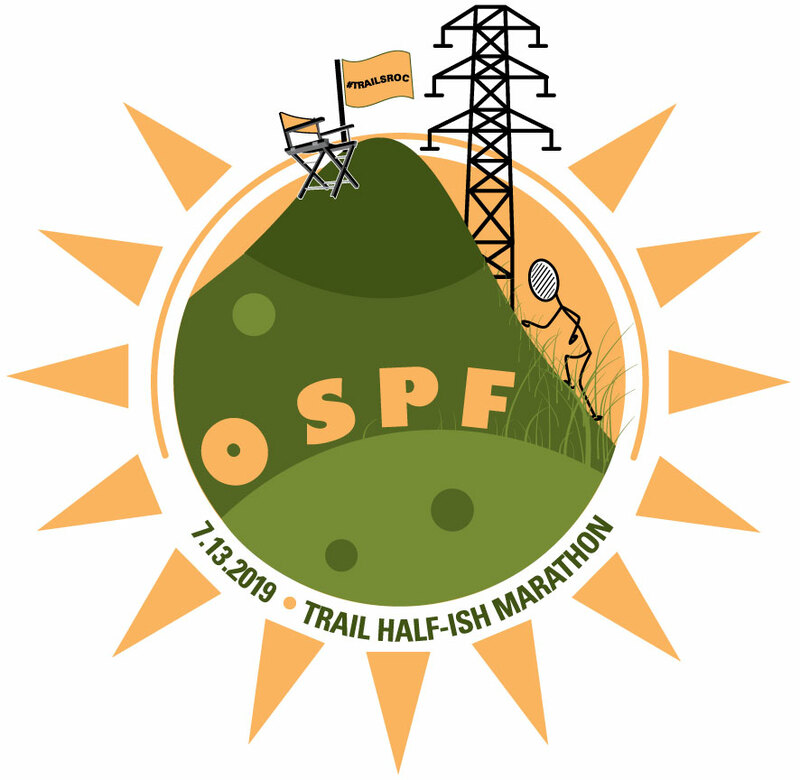 #TrailsRoc is thrilled to be offering the 0 SPF as a fundraiser for the #TrailsRoc scholarship as well as funding projects on the Victor Hiking Trails and The Crescent Trail. This is a Green Race – The water stations are “Refill Only”. Each runner will be required to carry their own hydration system on the course with them – There will not be “cups” available at the refill stations. Course Cut Off information: Due to weddings and events up at Woodcliff, our permit stipulates that runners are required to clear the turn around by 10:00 am ( 7 miles in 2.5 hours) If runners are not through the turn at this point we will give them a ride back to the finish. Registration closes a week before the race, and there is no day-of registration. Seneca Trail – Starting at Valentown this trail is part of a historical footpath and is named for the Seneca Indians who had a main trail from Bare Hill by Canandaigua Lake through Ganondagan to Irondequoit Bay at least paralleling this trail. A varied trail with grass, single track, creek crossings, this trail will give you everything you look for in trail running. Crescent Trail – The Crescent Trail is the home to our Tuesday morning trail runs. #TrailsRoc founders have trained for many races on these trails. With 35 miles of trails that are as well maintained as any in the Rochester area, we are sure you will love the experience of this trail system. #TrailsRoc Gives Back: This race is a fundraiser for the Victor Hiking Trails -The Crescent Trail Association – and the creation of the #TrailsRoc Sponsorship fund. The course starts and finishes at Valentown Historical Society Museum at High Point in Victor, NY. I was planning to drive two hours up from Ithaca this weekend to check out the course. Are the trails marked, starting at Valentown Historical building? 2 things, the download link is broken and wait a minute.. there are hills on this course? Is it acceptable to walk this event? Is there another race this summer? Just finished the 0SPF Trail 1/2 marathon. This was one of my favorite races. Great course, great volunteers, great racers!!! This one is a must run.